The International Society of Service Innovation Professionals, ISSIP (pronounced iZip), a professional association co-founded by IBM, Cisco, HP and several Universities with a mission to promote Service Innovation for our interconnected world, and the National Science Foundation (NSF), organized a two-day workshop to bring together US-based and international thought leaders from a variety of disciplines in industry and academia to outline a long-term human-technology research agenda that will enable smart service systems of the future. Service systems contribute to more than 75% of the U.S. GDP and provide close to 80% of employment. It has been demonstrated that the integration of technology as an aid to the human worker can result in dramatic improvements in productivity by augmenting human capabilities in the workplace. Hence, in the next few decades technology-based innovations in service systems can have enormous economic importance for the United States. Smart service systems also have the potential to become the conduit and drivers of social innovations addressing major societal problems. 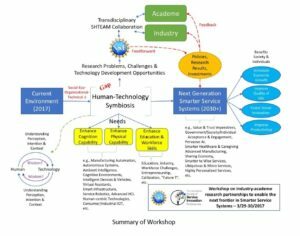 The agenda of the workshop can have transformative impact on the US economy and beyond by identifying the grand challenges that industry faces, not only for today’s service systems, but for the service systems envisioned in 20-30 years. The ultimate objective is to bring attention to academic research on technologies that neither industry nor academia are working on at the moment but that are necessary to enable this next generation of service systems. These futuristic services are likely to be enabled by the automation of the built environment capable of providing innovative services by teaming with humans for the benefit of individuals and society. Examples are those enabled by ambient intelligence, cognitive environments, virtual assistants, service robots, intelligent vehicles, smart infrastructure, autonomous systems, and intelligent devices of all sorts, networked by the Internet-of-Things (IoT) and other communication paradigms. The departments from which academic researchers will be drawn to work on these challenges will be diverse. Participants were selected based on a broad range of expertise across a variety of research fields, including engineering, information technology, computer science, operations research, optimization, and social and behavioral sciences. In particular, researchers who were already interested in transdisciplinary collaborations were invited. Industry researchers from Fortune 500 companies in the smart services space were also invited. With more than a 1200 members with diverse backgrounds representing industry, academia, and government, ISSIP (the International Society of Service Innovation Professionals) was uniquely positioned to convene such workshops. In the 2-day workshop, 58 experts from industry, academia, and government foundations came together and identifies 8 themes for future long-term research. ● On people-technology symbiosis, foster research collaborations that study “wisdom computing” and interdisciplinary research to study a network of robots with humans at the periphery, or part of the network – swarm intelligence – with command and control, and emergent peer-peer scenarios. ● On People-Technology symbiosis to restore/augment/enhance physical human capabilities, foster human-centric research and education in cross-cutting disciplines. ● On People-Technology symbiosis to augment/enhance cognitive human capabilities, drive Citizen Science projects – Consider university funding to build “charter city” testbeds, requiring academia – industry collaboration with a long term research horizon (10-15 years). ● On Healthcare and Technology, develop a program to study and invite stakeholders to address the grand challenges for prevention of chronic diseases using crowdsourcing to scale. ● On Future Workforce Challenges, support development of pilot ecosystems of fluid work, workers, and learners and sponsor research to explore new paradigms of work and labor and training. ● On working with Industry Challenges, foster research collaborations to study university-industry collaboration as a service system, and potentially fund the development of a people – cyber infrastructure to support industry – university collaboration, and startups, angels, and VC ecosystems. could help provide seed funding that encourages industry/university engagement. ● On IoT services,foster research collaborations that could act as an accelerator to provide research funding for industry-academe interdisciplinary research of IoT elements, systems and services to drive proliferation of use cases and scalability. The figure below summarizes the theme, discussion, and recommendations produced at the workshop.